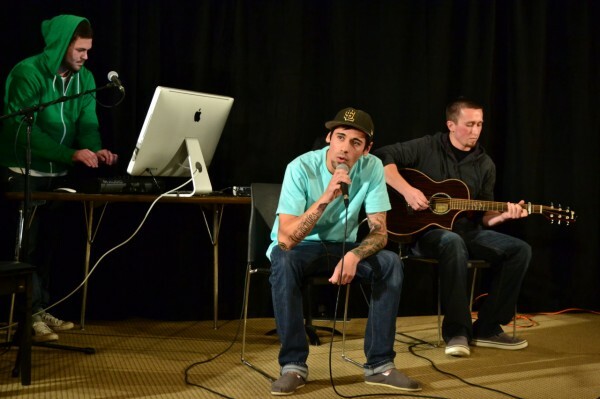 Every semester, Salt Lake Community College students taking a songwriting class have the opportunity to showcase the songs they have been working on. This semester’s rendition took place on December 1 at the Taylorsville Redwood Campus. The night was full of a whole variety of different genres of music. Each student had a different way of portraying their thoughts and feelings. “These are just some of the students that were selected by the teachers to participate,” said Thomas Baggaley, assistant professor of music. Started by Baggaley six years ago, the show was broadcast on SLCC TV for the second time. Taking the role of master of ceremonies, Baggaley introduced each act and told interesting tidbits about the students. One student announced that you can friend him on Facebook, portraying a loose, comfortable atmosphere for performers and audience members. Many of the students performing were doing so for the first time. Several of them acknowledged it by exclaiming how nervous they were before beginning their song. However, the opportunity they had to share their talents did not only make a fun night for spectators, but was beneficial for them in gaining confidence and experience. As the department of music grows year by year, interested students gather in eager to indulge in their passion of music. It has been anticipated by Baggaley for the past five years, as he has been adding classes, to add a degree program. It is expected that the Board of Trustees will decide this month whether or not these degrees have been approved. If ratified, the classes will begin in the fall of 2012. As for the spring, classes will continue as normal and performance opportunities, such as the showcase, will be present. “If you’re interested in songwriting, even if you are a nursing major or an auto mechanics major, we’d love to have you join our classes,” Baggaley said.